CALUMET — An upper peninsula ice rink is hoping to receive a helping hand from one of America’s favorite cheese makers. Kraft Inc, is holding it’s annual Hockeyville USA promotion, where 1 hockey arena in the United States will receive 100 thousand dollars from the dairy producer, to be used on stadium upgrades. Hockey and the Copper Country have a long standing relationship. The city of Houghton is officially known as the birthplace of professional hockey, where the first team of paid players would perform at the Amphidome, before it was destroyed by fire 25 years later. In mid-season, and without a rink, high school hockey was canceled for the rest of the year, and the college team had to search for another venue. 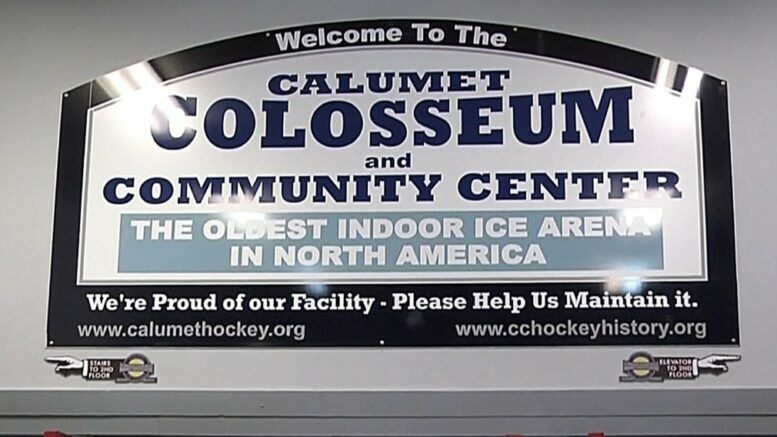 “There’s a lot of history, really with the whole upper peninsula and hockey,” said John Carroll, a former trustee of the Calumet Jr. Hockey Association. Eventually the Amphidome was replaced, and is now called Dee Stadium. But this story isn’t about the Amphidome or Dee Stadium, or Houghton… it’s about another stadium several miles to the north. “The building was built in 1913 and it’s been in continuous use since that day,” said Paul Lehto, the Calumet Township Supervisor. The college hockey team that year was made up of students from the Michigan College of Mines. The hands of time would change the name of the school to Michigan Tech, and the name of the team to the Huskies. Today the Huskies play on campus in their own area, but the venue that provided refuge and salvaged the season of early 1928 was the Calumet Colosseum. Now 105 years old, the Colleseum is still standing, in fact it is the oldest indoor hockey arena in the country that is still in use today. Houghton DJ John Carroll was on the board for the Calumet Jr. Hockey Association four years ago, and initiated a Hockeyville USA campaign that was well supported by community members. Kraft’s contest asks community members to submit stories, photos and to describe the importance of hockey to that community. And a panel of judges will review the entries one by one. The Colosseum’s entries in 2015 impressed the judges enough to make it through the initial cut, but not the final. “We didn’t make the effort we should have” Lehto said. This year, the Colosseum has entered the contest again, with a new push for community support. Copper Country residents, or anyone who has a story to tell about the Colosseum, or Calumet Hockey is encouraged to submit that memoir to www.krafthockeyville.com. “Three to five thousand people a week go through this building. It’s like the community center of our community,” said Lehto. “When you put together that with the history of hockey going back well over a hundred years, there’s a lot of history and things to build on,” said Carroll. “It’s got a really good story to tell.” – Carroll. Upon consideration from the judges, the winning arena will receive a check from the Chicago based cheese maker for $150,000. Lehto says that if the Colosseum were to win, that money would be used to upgrade the sound system, and ice making equipment that will be obsolete in the upcoming future. The venue would also host a pre season NHL game next year, as part of the contest prize. Entries are required by March 2nd, and initial review will take place in the following days, with a final 4 to be announced on March 24th. Those four venues would then subject to an online public vote that will determine a winner. “Maybe this will be the time when we can push it through and win the whole thing,” said Carroll.